When I was a kid growing up in Wisconsin, I had a friend who’s father owned a hunting shack in the woods up north. Relatively, it wasn’t that remote, but as soon as you entered the thick woods it was like being completely alone. My friend’s father would tell us these ridiculous stories about the monsters that roamed through the trees. One of them was a very tall man. He was over seven feet tall and had the head of a pig. The story was nonsense, but as we drove through the winding roads back to the town, I liked to imagine that the man was real. This tall-tale would haunt my dreams I thought of it so much. 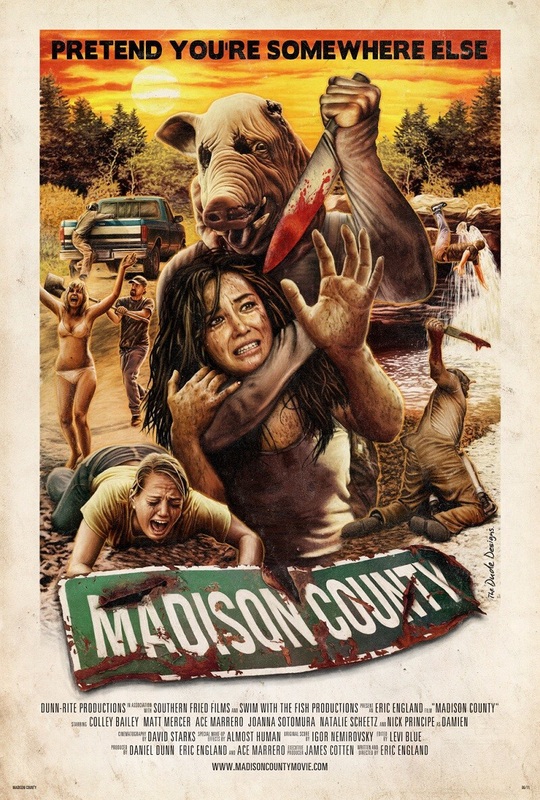 Lo and behold there exists Madison County – a film that seems to have taken those nightmares and put them on screen. But after watching this 2011 film, my nightmares would have been a much more entertaining affair. This movie has almost every horror movie cliche one could dream up. Shall we consult the check list? I could go on because literally nothing about this movie was shocking or original. Nothing. There is even a book that has mysteries BUT IS NOT EVEN MYSTERIOUS. So on to the plot? I bet you can guess it before I even write it. Five kids decide to go on a trip to Madison County where true crime novelist David Randall lives. He wrote a book about a murderer named Damien Ewell, who apparently no one believes exists. College student James has been granted an interview with the writer and seems convinced that his book is real. The five are stopped by a trucker who tells them to take a shortcut. They decide to ignore him and stick to the highway. They stop again to meet some of the locals at a, of course, super creepy gas station filled with hillbilly locals. Of course several of them have their share of ominous threats. Really makes you scared, only it doesn’t because they all have Southern accents. Fun fact (of sorts) there is no Madison County in Wisconsin. But apparently in this fictional place everyone moved from the South to wreak havoc because that is the only way I can explain the bizarre accents of the locals. I guess this was probably the film’s way of telling the audience that these people were stupid. But sweet Erma (who is literally the best part of this movie) gives James and his cohorts the old address of David Randall, despite telling them that he moved away years ago. The group arrive to an empty house, so they split up (cliche, check!) and look for information. Suddenly everything moves very quickly. Everyone gets knocked off in quick procession and there is hardly a build up to any of it. Suspense is dead, everyone! This is another one of those films that tries to pretend it was based on a true story. This is the most gimmicky thing imaginable. Actually, add that to the check list of cliches. Still, according to director Eric England, this film is based on events in his childhood and stories he dramatised. Now that’s convincing! I really hope it was the pig mask that was the bit from childhood. Because that is probably supposed to be the scariest bit about this movie, and it kind of is. The killer dons this sort of empty pig corpse head and squeals about during fight scenes. No idea why he can’t talk. Probably because at this point I was planning on a nice nap and sudoku for afterwards. Good god was I bored by this film. The saving grace was that it was super short. The kills were certainly swift. While it could have used ten minutes to, I don’t know, include more information on the story or explain why things were actually happening (there was some story about locals not liking outsiders, which is pretty plausible for small town Wisconsin). But clearly they were not interested in giving much away. I get that it was supposed to be ominous or mysterious, but their explanation was so weak that I didn’t buy it for a minute. No one should waste their time with this film unless idiotic wandering and weaker slasher films sounds interesting. This is a film that perfectly exemplifies why people are losing interest in horror movies. Don’t give anyone anything original and eventually they will show as little passion as was put in to making it. Considering this was an indie film makes it all even more confounding. This is the type of lame story that a bored major studio would knock out. But all the same, at least it was mildly fun to watch the poor souls die. Pretty safe to say they all deserved it.